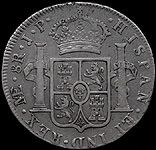 Comments: This is an example of the "portrait" or "modified pillar" design with a portrait of Charles III on the obverse and the Spanish arms between the two pillars on the reverse. 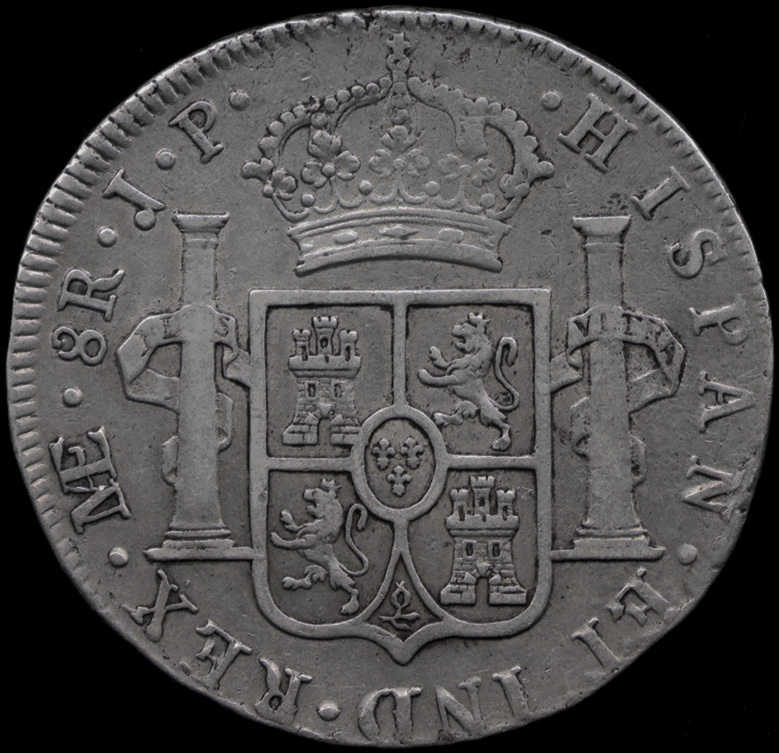 In the reverse legend the monogram 'PTS' is the mintmark indicating the coin was produced at the mint in Potosí, Bolivia. 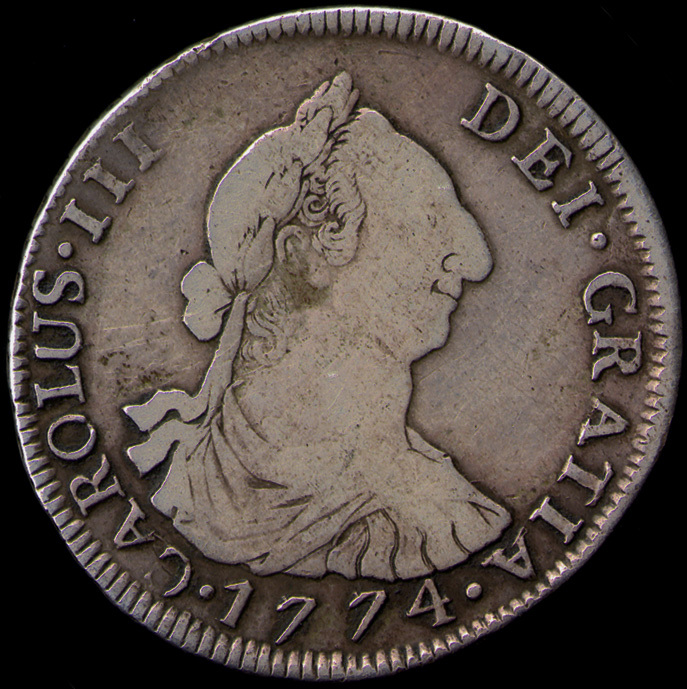 This is followd by '4 R' which indicates the denomination of four reales. The J and the R are the initials of the assayers, José de Vargas y Flores and Raimundo de Iturriaga who worked together from 1767-1776 and in 1778 (see Pellicer i Bru, Glosario, pp. 45 and 140). Comments: This is an exampe of the first milled or "pillar" coinage. 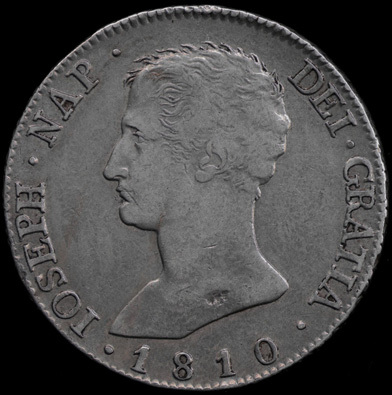 This coin was minted in the first year of Charles III's reign. 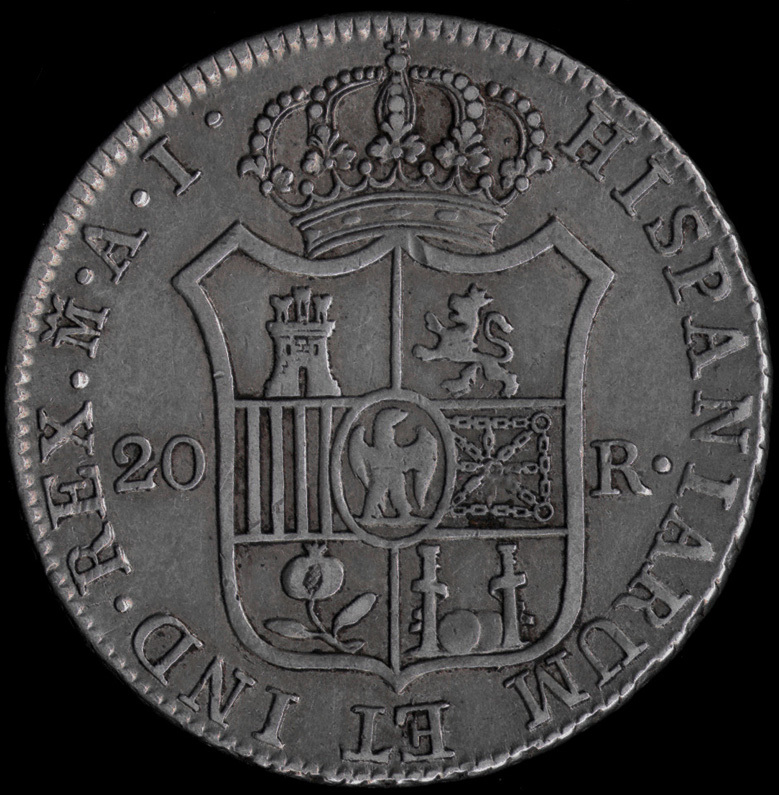 On the obverse to the left of the crowned Spanish arms there is . M M [four pedal rosette] representing the initials of the assayers Manual de Leon and Manuel Assorin who worked together 1748-1752 and again 1754-1765 (see, Pellicer i Bru, Glosario, pp. 40 and 154). 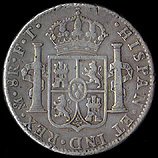 To the right of the arms is the denomination 8 with a rosette above and below, for eight reales. 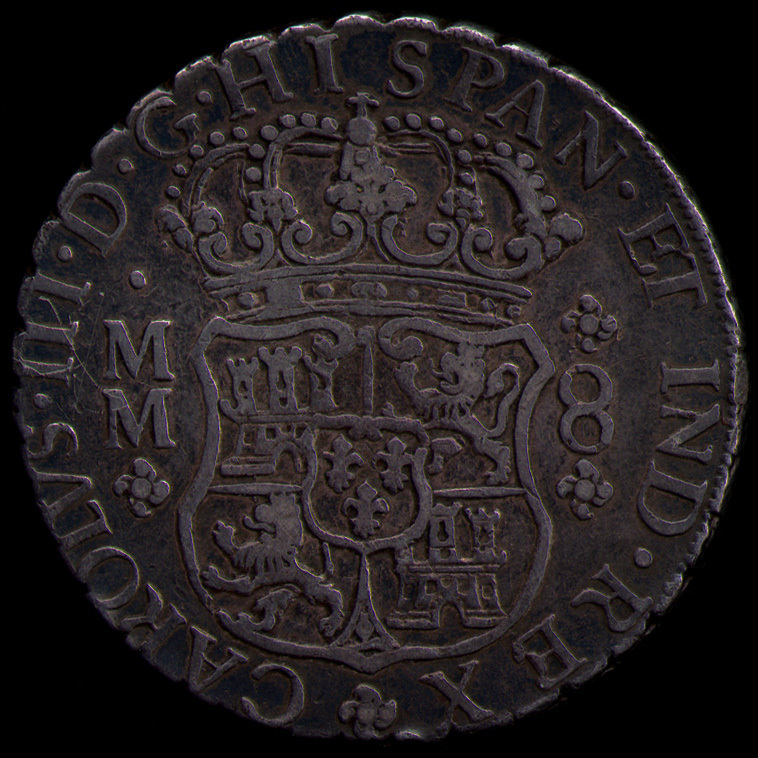 On the reverse Mo is the mintmark for Mexico City. On banners attached to the pillars is PLUS VLTR, an abbreviation for the motto Plus Ultra (More Beyond). 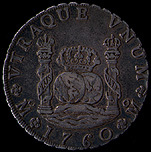 The design of the crown found on top of the left pillar was changed in 1754. Prior to that time both crowns were identical, representing the royal Spanish crown. In 1754 the left crown on the eight reales coin was changed to the Imperial design as can be seen on this example. Comments: This is an example of the "portrait" or "modified pillar" design. 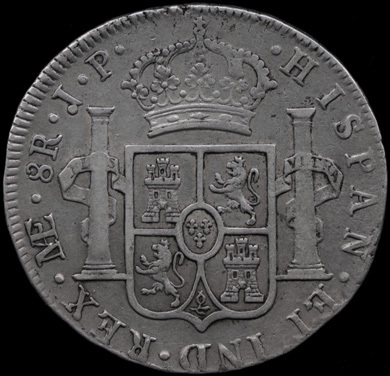 In the reverse legend the monogram 'PTS' is the mintmark indicating the coin was produced at the mint in Potosí, Bolivia. 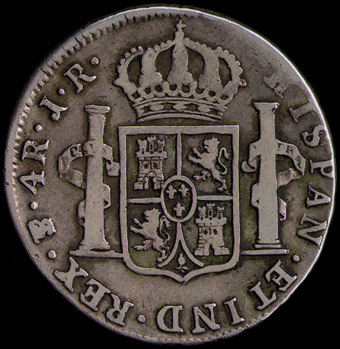 This is followd by '8 R' which indicates the denomination of eight reales. 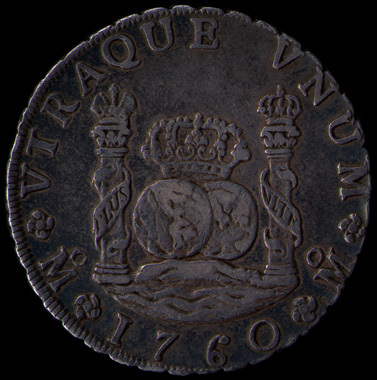 The P and the R are the initials of the assayers, Pedro Narciso de Mazondo and Raimundo de Iturriaga who worked together from 1776-1795 and 1796 (see Pellicer i Bru, Glosario, pp. 45 and 174). This example has a hole at 12:00 o'clock. 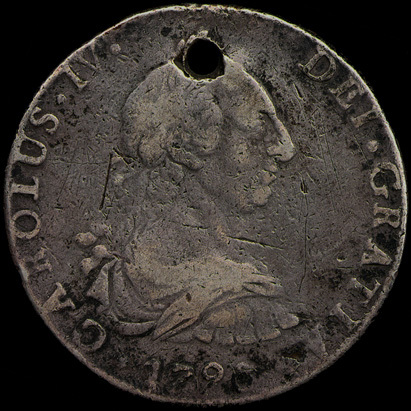 According to Thomas Kays holed coins were like modern traveller's checks. A traveller would sew or pin several of these coins into the lining or inside of their jacket and use them as needed. 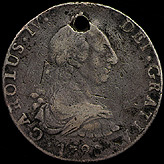 Charles IV ascended to the throne following the death of Charles III on December 14, 1788 and reigned until 1808. 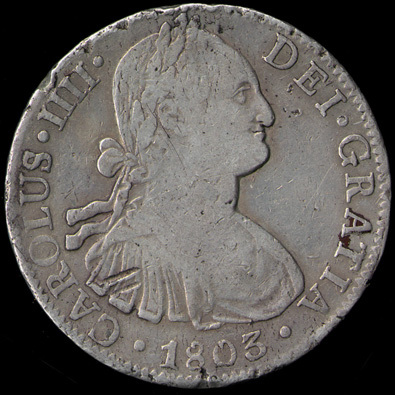 However, due to the problems relating to the production and transportation of new dies for the colonial mints an edict of December 24, 1788 allowed the American mints to continue producing coins using dies with the portrait of Charles III but changing the name to Charles IV. 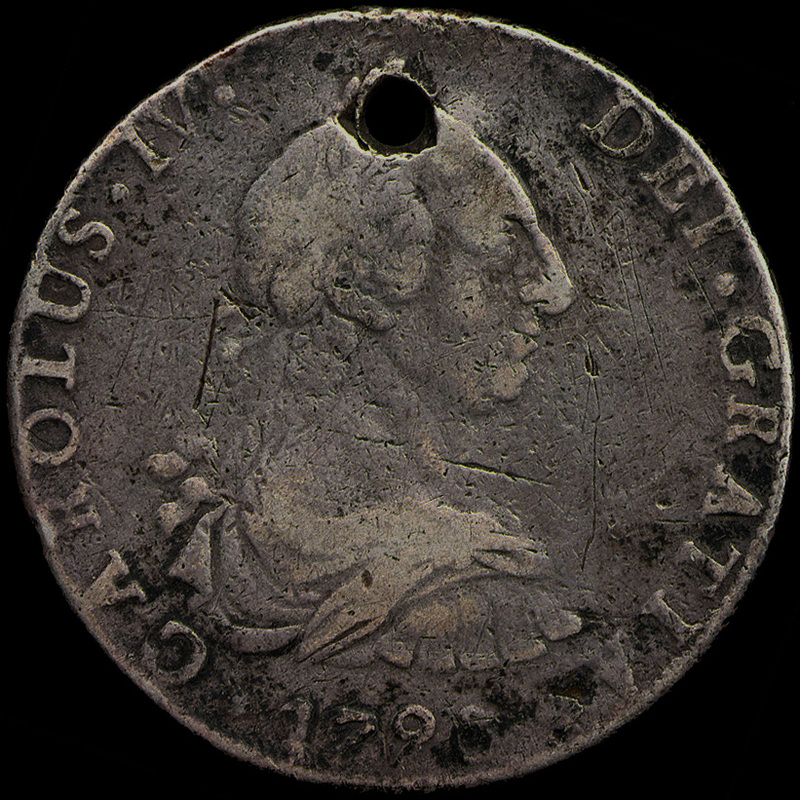 In Potosí the first coins on 1789 had the name of Charles III, during that year the portrait was retained but the name was changed to Charles IV, similar coins were produced throughout 1790, as the present example. 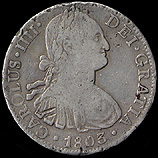 The 1791 Potosí coins have the new portrait of Charles IV. 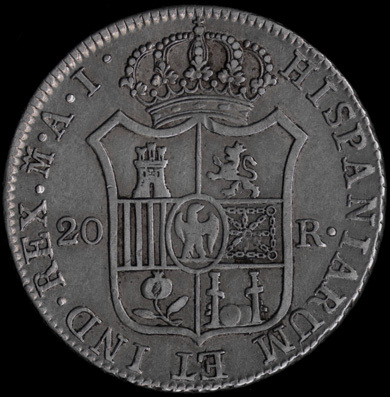 Comments: This is an example of the "portrait" or "modified pillar" design with a portrait of Charles IV on the obverse and the Spanish arms between the two pillars on the reverse. 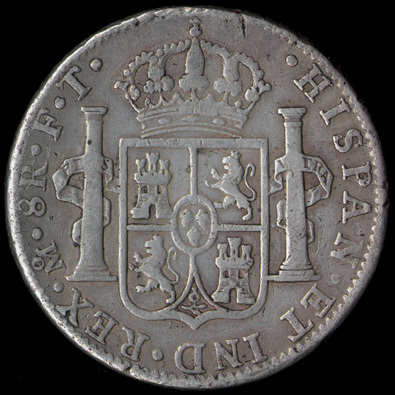 In the reverse legend Mo is the mintmark indicating the coin was produced at the mint in Mexico City. 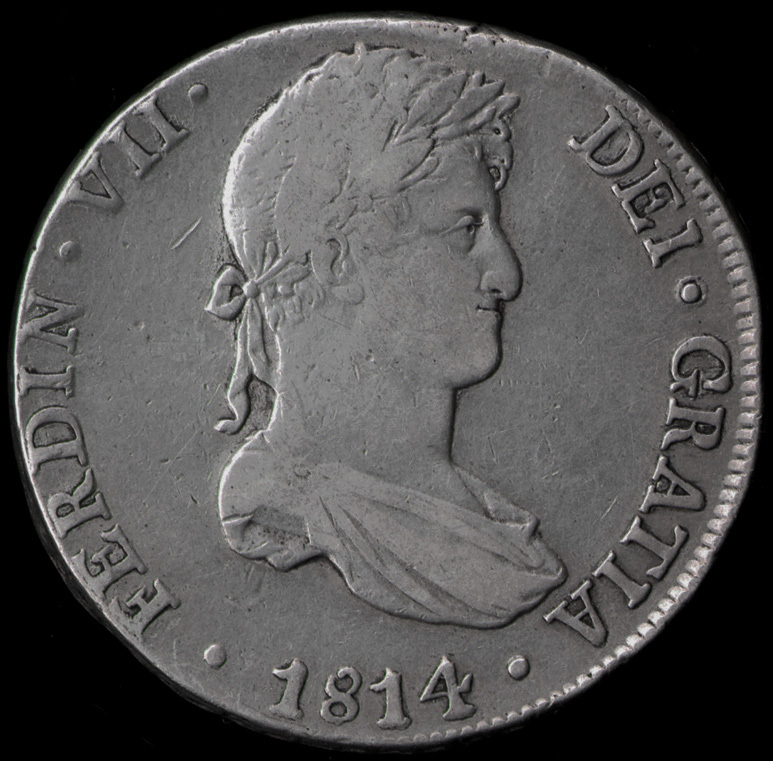 This is followd by '8 R' which indicates the denomination of eight reales. 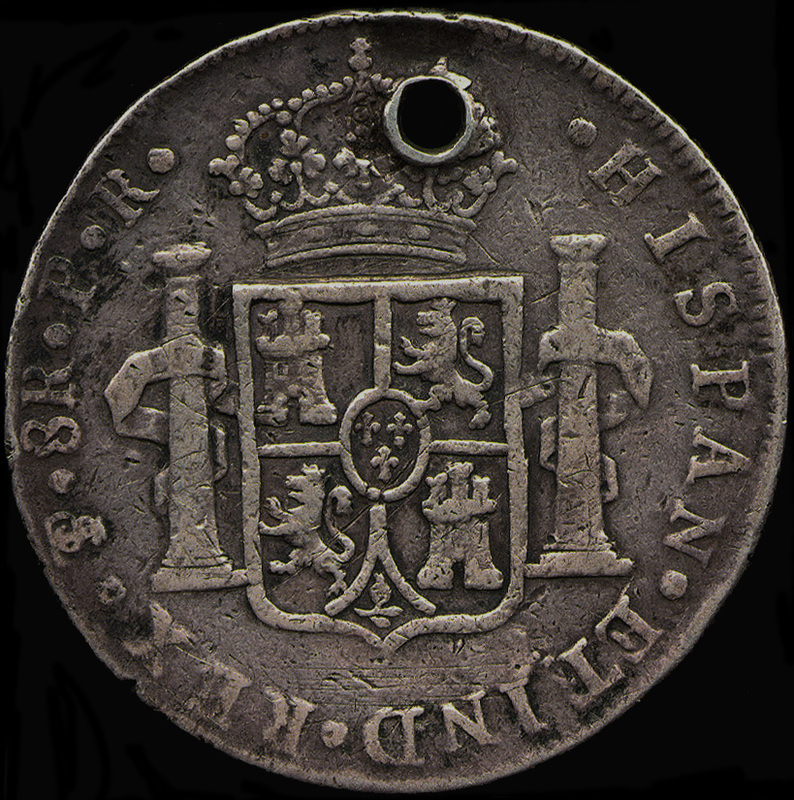 The initials F and T are for the assayers, Francisco Arance y Cobos and Tomás Butrón y Miranda who worked together from 1801-1803 (see Pellicer i Bru, Glosario, pp. 40 and 111). 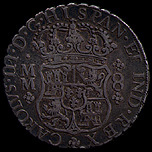 Comments: This is an example of the "portrait" or "modified pillar" design with a portrait of Charles IV on the obverse and the Spanish arms between the two pillars on the reverse. In the reverse legend the monogram 'LIMAE' is the mintmark indicating the coin was produced at the mint in Lima, Peru. This is followd by '8 R' which indicates the denomination of eight reales. 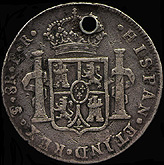 The J and the P are the initials of the assayers, Juan Martínez de Roxas and Pablo Cano Melgarejo who worked together from 1803-1823 (see Pellicer i Bru, Glosario, pp. 31 and 139). Comments: This is an example of a new denomination coin minted in Madrid during the Napoleonic era (1808-1814), when Joseph Napoleon assumed control. 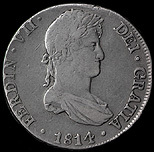 The new coinage, called De Vellon Coinage, was minted in 1, 2, 4, 10 and 20 reales silver coins as well as 80, 160 and 320 reales gold coins. In colonial Spain coins produced during this period still had the royal portrait of Ferdinand VII. 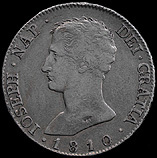 Circulation of Napoleonic coinage was limited to Spain, it was not used in colonial Spain and certainly did not make its way to the United States. 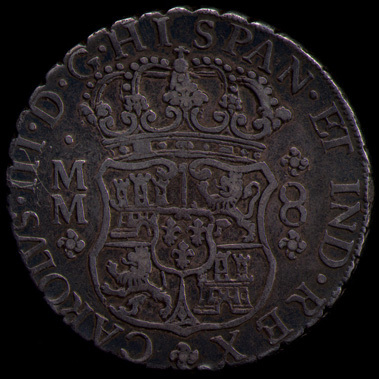 The example we have is displayed here as an addenda, for those interested in Spanish coinage. 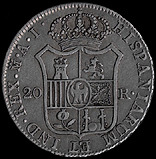 On the reverse to the left of the newly redesigned crowned shield is 20 while to the right is R ., for the denomination 20 reales. In the legend the mintmark of a crowned M is for Madrid. The initials A and I are for the assayers Antonio Rafael Narváez and Isisdoro Ramos del Manzano who worked together 1808-1812 (see Pellicer i Bru, Glosario, pp. 33 and 75).